American poet and essayist, born in Boston, Massachusetts, on the 25th of May 1803. Seven of his ancestors were ministers of New England churches. Among them were some of those men of mark who made the backbone of the American character: the sturdy Puritan, Peter Bulkeley, sometime rector of Odell in Bedfordshire, and afterward pastor of the church in the wilderness at Concord, New Hampshire; the zealous evangelist, Father Samuel Moody of Agamenticus in Maine, who pursued graceless sinners even into the alehouse; Joseph Emerson of Malden, a "heroic scholar" who prayed every night that no descendant of his might ever be rich; and William Emerson of Concord, Mass., the patriot preacher, who died while serving in the army of the Revolution. Sprung from such stock, Emerson inherited qualities of self-reliance, love of liberty, strenuous virtue, sincerity, sobriety and fearless loyalty to ideals. The form of his ideals was modified by the metamorphic glow of Transcendentalism which passed through the region of Boston in the second quarter of the 19th century. But the spirit in which Emerson conceived the laws of life, reverenced them and lived them out, was the Puritan spirit, elevated, enlarged and beautified by the poetic temperament. His father was the Rev. William Emerson, minister of the First Church (Unitarian) in Boston. Ralph Waldo was the fourth child in a family of eight, of whom at least three gave evidence of extraordinary mental powers. He was brought up in an atmosphere of hard work, of moral discipline, and (after his father's death in 1811) of that wholesome self-sacrifice which is a condition of life for those who are poor in money and rich in spirit. His aunt, Miss Mary Moody Emerson, a brilliant old maid, an eccentric saint, was a potent factor in his education. Loving him, believing in his powers, passionately desiring for him a successful career, but clinging with both hands to the old forms of faith from which he floated away, this solitary, intense woman did as much as any one to form, by action and reaction, the mind and character of the young Emerson. In 1817 he entered Harvard College, and graduated in 1821. In scholarship he ranked about the middle of his class. In literature and oratory he was more distinguished, receiving a Boylston prize for declamation, and two Bowdoin prizes for dissertations, the first essay being on "The Character of Socrates" and the second on "The Present State of Ethical Philosophy" -- both rather dull, formal, didactic productions. He was fond of reading and of writing verse, and was chosen as the poet for class-day. His cheerful serenity of manner, his tranquil mirthfulness, and the steady charm of his personality made him a favorite with his fellows, in spite of a certain reserve. His literary taste was conventional, including the standard British writers, with a preference for Shakespeare among the poets, George Berkeley among the philosophers, and Montaigne (in Charles Cotton's translation) among the essayists. His particular admiration among the college professors was the stately rhetorician, Edward Everett; and this predilection had much to do with his early ambition to be a professor of rhetoric and elocution. Immediately after graduation he became an assistant in his brother William's school for young ladies in Boston, and continued teaching, with much inward reluctance and discomfort, for three years. The routine was distasteful; he despised the superficial details which claimed so much of his time. The bonds of conventionalism were silently dissolving in the rising glow of his poetic nature. Independence, sincerity, reality, grew more and more necessary to him. His aunt urged him to seek retirement, self-reliance, friendship with nature; to be no longer "the nursling of surrounding circumstances", but to prepare a celestial abode for the muse. The passion for spiritual leadership stirred within him. The ministry seemed to offer the fairest field for its satisfaction. In 1825 he entered the divinity school at Cambridge, to prepare himself for the Unitarian pulpit. His course was much interrupted by ill-health. His studies were irregular, and far more philosophical and literary than theological. In October 1826 he was "approbated to preach" by the Middlesex Association of Ministers. The same year a threatened consumption compelled him to take a long journey in the south. Returning in 1827, he continued his studies, preached as a candidate in various churches, and improved in health. In 1829 he married a beautiful but delicate young woman, Miss Ellen Tucker of Concord, and was installed as associate minister of the Second Church (Unitarian) in Boston. The retirement of his senior colleague soon left him the sole pastor. Emerson's early sermons were simple, direct, unconventional. He dealt freely with the things of the spirit. There was a homely elevation in his discourses, a natural freshness in his piety, a quiet enthusiasm in his manner, that charmed thoughtful hearers. Early in 1832 he lost his wife, a sorrow that deeply depressed him in health and spirits. Following his passion for independence and sincerity, he arrived at the conviction that the Lord's Supper was not intended by Christ to be a permanent sacrament. To him, at least, it had become an outgrown form. He was willing to continue the service only if the use of the elements should be dropped and the rite made simply an act of spiritual remembrance. Setting forth these views, candidly and calmly, in a sermon, he found his congregation, not unnaturally, reluctant to agree with him, and therefore retired, not without some disappointment, from the pastoral office. He never again took charge of a parish; but he continued to preach, as opportunity offered, until 1847. In fact, he was always a preacher, though of a singular order. His supreme task was to befriend and guide the inner life of man. The strongest influences in his development kbout this time were the liberating philosophy of Samuel Taylor Coleridge, the mystical visions of Emanuel Swedenborg, the intimate poetry of William Wordsworth, and the stimulating essays of Thomas Carlyle. On Christmas Day 1832 he took passage in a sailing vessel for the Mediterranean. He travelled through Italy, visited Paris, spent two months in Scotland and England, and saw the four men whom he most desired to see -- Landor, Coleridge, Carlyle and Wordsworth. "The comfort of meeting such men of genius as these", he wrote, "is that they talk sincerely." But he adds that he found all four of them, in different degrees, deficient in insight into religious truth. His visit to Carlyle, in the lonely farm-house at Craigenputtock, was the memorable beginning of a lifelong friendship. Emerson published Carlyle's first books in America. Carlyle introduced Emerson's Essays into England. The two men were bound together by a mutual respect deeper than a sympathy of tastes, and a community of spirit stronger than a similarity of opinions. Emerson was a sweet-tempered Carlyle, living in the sunshine. Carlyle was a militant Emerson, moving amid thunderclouds. The things that each most admired in the other were self-reliance, directness, moral courage. A passage in Emerson's Diary, written on his homeward voyage, strikes the keynote of his remaining life. "A man contains all that is needful to his government within himself... All real good or evil that can befall him must be from himself... There is a correspondence between the human soul and everything that exists in the world; more properly, everything that is known to man. Instead of studying things without, the principles of them all may be penetrated into within him... The purpose of life seems to be to acquaint man with himself... The highest revelation is that God is in every man." Here is the essence of that intuitional philosophy, commonly called Transcendentalism. Emerson disclaimed allegiance to that philosophy. He called it "the saturnalia, or excess of faith." His practical common sense recoiled from the amazing conclusions which were drawn from it by many of its more eccentric advocates. His independence revolted against being bound to any scheme or system of doctrine, however nebulous. He said: "I wish to say what I feel and think today, with the proviso that tomorrow perhaps I shall contradict it all." But this very wish commits him to the doctrine of the inner light. All through his life he navigated the Transcendental sea, piloted by a clear moral sense, warned off the rocks by the saving grace of humor, and kept from capsizing by a good ballast of New England prudence. After his return from England in 1833 he went to live with his mother at the old manse in Concord, Massachusetts, and began his career as a lecturer in Boston. His first discourses were delivered before the Society of Natural History and the Mechanics Institute. They were chiefly on scientific subjects, approached in a poetic spirit. In the autumn of 1835 he married Miss Lydia Jackson of Plymouth, having previously purchased a spacious old house and garden at Concord. There he spent the remainder of his life, a devoted husband, a wise and tender father, a careful householder, a virtuous villager, a friendly neighbor, and, spite of all his disclaimers, the central and luminous figure among the Transcendentalists. The doctrine which in others seemed to produce all sorts of extravagances -- communistic experiments at Brook Farm and Fruitlands, weird schemes of political reform, long hair on men and short hair on women -- in his sane, well-balanced nature served only to lend an ideal charm to the familiar outline of a plain, orderly New England life. Some mild departures from established routine he tranquilly tested and as tranquilly abandoned. He tried vegetarianism for a while, but gave it up when he found that it did him no particular good. An attempt to illustrate household equality by having the servants sit at table with the rest of the family was frustrated by the dislike of his two sensible domestics for such an inconvenient arrangement. His theory that manual labor should form part of the scholar's life was checked by the personal discovery that hard labor in the fields meant poor work in the study. "The writer shall not dig", was his practical conclusion. Intellectual independence was what he chiefly desired; and this, he found, could be attained in a manner of living not outwardly different from that of the average college professor or country minister. And yet it was to this property-holding, debt-paying, law-abiding, well-dressed, courteous-mannered citizen of Concord that the ardent and enthusiastic turned as the prophet of the new idealism. The influence of other Transcendental teachers, Dr. Hedge, Dr. Ripley, Bronson Alcott, Orestes Brownson, Theodore Parker, Margaret Fuller, Henry David Thoreau, Jones Very, was narrow and parochial compared with that of Emerson. Something in his imperturbable, kindly presence, his angelic look, his musical voice, his commanding style of thought and speech, announced him as the possessor of the great secret which many were seeking -- the secret of a freer, deeper, more harmonious life. More and more, as his fame spread, those "who would live in the spirit" came to listen to the voice, and to sit at the feet, of the Sage of Concord. It was on the lecture-platform that he found his power and won his fame. The courses of lectures that he delivered at the Masonic Temple in Boston, during the winters of 1835 and 1836, on "Great Men", "English Literature", and "The Philosophy of History", were well attended and admired. They were followed by two discourses which commanded for him immediate recognition, part friendly and part hostile, as a new and potent personality. His Phi Beta Kappa oration at Harvard College in August 1837, on "The American Scholar", was an eloquent appeal for independence, sincerity, realism, in the intellectual life of America. His address before the graduating class of the divinity school at Cambridge, in 1838, was an impassioned protest against what he called "the defects of historical Christianity" (its undue reliance upon the personal authority of Jesus, and its failure to explore the moral nature of man as the fountain of establishd teaching), and a daring plea for absolute self-reliance and a new inspiration of religion. "In the soul", he said, "let redemption be sought. Wherever a man comes, there comes revolution. The old is for slaves. Go alone. Refuse the good models, even those which are sacred in the imagination of men. Cast conformity behind you, and acquaint men at first hand with Deity." 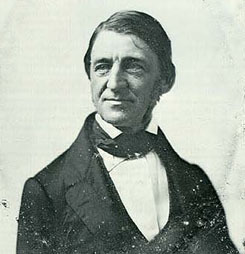 In this address Emerson laid his hand on the sensitive point of Unitarianism, which rejected the divinity of Jesus, but held fast to his supreme authority. A blaze of controversy sprang up at once. Conservatives attacked him; Radicals defended him. Emerson made no reply. But amid this somewhat fierce illumination he went forward steadily as a public lecturer. It was not his negations that made him popular; it was the eloquence with which he presented the positive side of his doctrine. Whatever the titles of his discourses, "Literary Ethics", "Man the Reformer", "The Present Age", "The Method of Nature", "Representative Men", "The Conduct of Life", their theme was always the same, namely, "the infinitude of the private man." Those who thought him astray on the subject of religion listened to him with delight when he poetized the commonplaces of art, politics, literature or the household. His utterance was Delphic, inspirational. There was magic in his elocution. The simplicity and symmetry of his sentences, the modulations of his thrilling voice, the radiance of his fine face, even his slight hesitations and pauses over his manuscript, lent a strange charm to his speech. For more than a generation he went about the country lecturing in cities, towns and villages, before learned societies, rustic lyceums and colleges; and there was no man on the platform in America who excelled him in distinction, in authority, or in stimulating eloquence. In 1847 Emerson visited Great Britain for the second time, was welcomed by Carlyle, lectured to appreciative audiences in Manchester, Liverpool, Edinburgh and London, made many new friends among the best English people, paid a brief visit to Paris, and returned home in July 1848. "I leave England", he wrote, "with increased respect for the Englishman. His stuff or substance seems to be the best in the world. I forgive him all his pride. My respect is the more generous that I have no sympathy with him, only an admiration." The impressions of this journey were embodied in a book called English Traits, published in 1856. It might be called "English Traits and American Confessions", for nowhere does Emerson's Americanism come out more strongly. But the America that he loved and admired was the ideal, the potential America. For the actual conditions of social and political life in his own time he had a fine scorn. He was an intellectual Brahmin. His principles were democratic, his tastes aristocratic. He did not like crowds, streets, hotels -- "the people who fill them oppress me with their excessive civility." Humanity was his hero. He loved man, but he was not fond of men. He had grave doubts about universal suffrage. He took a sincere interest in social and political reform, but towards specific "reforms" his attitude was somewhat remote and visionary. On the subject of temperance he held aloof from the intemperate methods of the violent prohibitionists. He was a believer in woman's rights, but he was lukewarm towards conventions in favor of woman suffrage. Even in regard to slavery he had serious hesitations about the ways of the abolitionists, and for a long time refused to be identified with them. But as the irrepressible conflict drew to a head Emerson's hesitation vanished. He said in 1856, "I think we must get rid of slavery, or we must get rid of freedom." With the outbreak of the Civil War he became an ardent and powerful advocate of the cause of the Union. James Russell Lowell said, "To him more than to all other causes did the young martyrs of our Civil War owe the sustaining strength of thoughtful heroism that is so touching in every record of their lives." Emerson the essayist was a condensation of Emerson the lecturer. His prose works, with the exception of the slender volume entitled Nature (1836), were collected and arranged from the manuscripts of his lectures. His method of writing was characteristic. He planted a subject in his mind, and waited for thoughts and illustrations to come to it, as birds or insects to a plant or flower. Whan an idea appeared, he followed it, "as a boy might hunt a butterfly"; when it was captured he pinned it in his "Thought-book." The writings of other men he used more for stimulus than for guidance. He said that books were for the scholar's idle times. "I value them", he said, "to make my top spin." His favorite reading was poetry and mystical philosophy: Shakespeare, Dante, George Herbert, Goethe, Berkeley, Coleridge, Swedenborg, Jakob Boehme, Plato, the new Platonists, and the religious books of the East (in translation). Next to these he valued books of biography and anecdote: Plutarch, Grimm, St. Simon, Varnhagen von Ense. He had some odd dislikes, and could find nothing in Aristophanes, Cervantes, Shelley, Sir Walter Scott, Jane Austen, Charles Dickens. Novels he seldom read. He was a follower of none, an original borrower from all. His illustrations were drawn from near and far. The zodiac of Denderah; the Savoyards who carved their pine-forests into toys; the naked Derar, horsed on an idea, charging a troop of Roman cavalry; the long, austere Pythagorean lustrum of silence; Napoleon on the deck of the "Bellerophon", observing the drill of the English soldiers; the Egyptian doctrine that every man has two pairs of eyes; Empedocles and his shoe; the horizontal stratification of the earth; a soft mushroom pushing its way through the hard ground -- all these allusions and a thousand more are found in the same volume. On his pages, close beside the Parthenon, the Sphinx, St. Paul's, Etna and Vesuvius, you will find the White Mountains, Monadnock, Agiocochook, Katahdin, the pickerelweed in bloom, the wild geese honking through the sky, the chick-a-dee braving the snow, Wall Street and State Street, cotton-mills, railroads and Quincy granite. For an abstract thinker he was strangely in love with the concrete facts of life. Idealism in him assumed the form of a vivid illumination of the real. From the pages of his teeming notebooks he took the material for his lectures, arranging and rearranging it under such titles as Nature, School, Home, Genius, Beauty and Manners, Self-Possession, Duty, The Superlative, Truth, The Anglo-Saxon, The Young American. When the lectures had served their purpose he rearranged the material in essays and published them. Thus appeared in succession the following volumes: Essays (First Series) (1841); Essays (Second Series) (1844); Representative Men (1850); English Traits (1856); The Conduct of Life (1860); Society and Solitude (1870); Letters and Social Aims (1876). Besides these, many other lectures were printed in separate form and in various combinations. Emerson's style is brilliant, epigrammatic, gem-like; clear in sentences, obscure in paragraphs. He was a sporadic observer. He saw by flashes. He said, "I do not know what arguments mean in reference to any expression of a thought." The coherence of his writing lies in his personality. His work is fused by a steady glow of optimism. Yet he states this optimism moderately. "The genius which preserves and guides the human race indicates itself by a small excess of good, a small balance in brute facts always favorable to the side of reason." His verse, though in form inferior to his prose, was perhaps a truer expression of his genius. He said, "I am born a poet"; and again, writing to Carlyle, he called himself "half a bard." He had "the vision", but not "the faculty divine" which translates the vision into music. In his two volumes of verse (Poems in 1846 and May Day and other Pieces in 1867) there are many passages of beautiful insight and profound feeling, some lines of surprising splendor, and a few poems, like "The Rhodora", "The Snowstorm", "Ode to Beauty", "Terminus", "The Concord Ode", and the marvellous "Threnody" on the death of his first-born boy, of beauty unmarred and penetrating truth. But the total value of his poetical work is discounted by the imperfection of metrical form, the presence of incongruous images, the predominance of the intellectual over the emotional element, and the lack of flow. It is the material of poetry not thoroughly worked out. But the genius from which it came -- the swift faculty of perception, the lofty imagination, the idealizing spirit enamored of reality -- was the secret source of all Emerson's greatness as a speaker and as a writer. Whatever verdict time may pass upon the bulk of his poetry, Emerson himself must be recognized as an original and true poet of a high order. His latter years were passed in peaceful honor at Concord. In 1866 Harvard College conferred upon him the degree of LL.D., and in 1867 he was elected an overseer. In 1870 he delivered a course of lectures before the university on "The Natural History of the Intellect." In 1872 his house was burned down, and was rebuilt by popular subscription. In the same year he went on his third foreign journey, going as far as Egypt. About this time began a failure in his powers, especially in his memory. But his character remained serene and unshaken in dignity. Steadily, tranquilly, cheerfully, he finished the voyage of life. Emerson died on the 27th of April 1882, and his body was laid to rest in the peaceful cemetery of Sleepy Hollow, in a grove on the edge of the village of Concord.